Stothart took lots of stick re his tendency to use classics themes, but this score shows his real talent for creating unique soundscape. Maybe this is a low bitrate clip but the age is more audible in this recording to me. Maybe you'll release "Thirty Seconds Over Tokyo" and "They Were Expendable" someday. You must be kidding. It has far more dynamic range plus more detail and a much more accurate stereo spread. Try playing it through your stereo system. Oh it seems I mistook the sound of the percussion for hiss. It has a very different sound than I am used to for more recent recordings. The CD is much better than the poster art. Was this really expected to draw in the patrons? The film is pretty ludicrous, what with so many caucasians playing Orientals. I remember a story told by Sir Cedric Hardwick where he claimed he along with several other caucasian actors were made up to look like Japanese for the Fox 1944 WWII film "The Purple Heart." A test of them was shot. Hardwick said after studio execs looked at the test, they wisely discarded the idea and instead went with Oriental actors. But back then, most Asian actors cast as Japanese were in fact Chinese. I guess the Japanese actors were all locked up in 'relocation' camps such as Manzanar. The original poster must be one of the most ugly of the era. You'd think Hepburn would have been horrified to have such an appalling portrait of her on public view. Looking at the neck, it looks like ET wearing a Hepburn mask for Halloween. 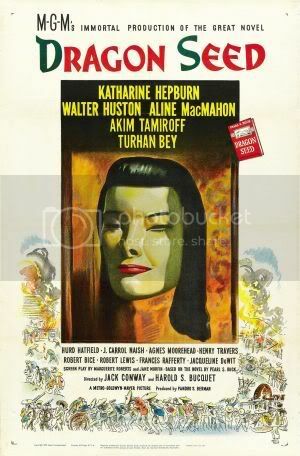 The fact that Hepburn accepted the role tells me she didn't care what the publicity art looked like. The photo didn't show up. One more time. No arguments with the aesthetics of the poster, but worry not---it is emblazoned on the back of the booklet, for all to see! This sounds WAY too good to pass up...ordered! This will be my first Herbert Stothart. "We'll be sailing along........on Turhan Bey.....la la la la la la lala....."
It's really amazing to think that sound is 1944 from dual mikes. Surely this must be some kind of first for a filmscore release on CD. It can't do old Herb's reputation any harm. The CD of Alfred Newman's score for "How Green is My Valley" (1941) is in a form of stereo taken from the close-up and long-shot microphone tracks mixed together. It sounds remarkable considering it was recorded nearly 70 years ago. 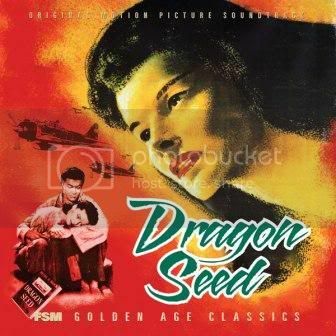 MGM used more than two mics for "Dragon Seed." By the 1940s most studios used a spread of up to eight microphones placed over the orchestra. Warner Brothers was doing this in the 1930s. Music mixer Arthur Piantadosi started at Warner Brothers in the 1930s working as a boom operator on the scoring stage. When the scoring mixer Dave Forrest learned that Piantadosi could read music he was given the job of moving the booms during a take so that microphones could cover more than just a limited area of the orchestra. He would follow the score and at specific cue mark would place one of the microphones over the section to be highlighted. He wore gum-soled shoes so his footsteps trotting over to another boom wouldn't be picked up by the sensitive microphones. Back then the WB scoring console had six inputs. Six microphones were used on scores like Korngold's "The Adventures of Robin Hood." Eventually, they graduated to eight mics when the console was expanded. That was sometime in the 1940s. wow, i'd better scrape up some $$$. i want this!!! For this week only, you can buy RANDOM HARVEST / THE YEARLING for only $14.95 on SAE so double up when you buy this one! "Random Harvest" is an excellent score. It's also a terrific film. Two mics! Is that not how "audiophiles" like their recordings to be made? A coincident pair or some such configuration. What I need to know is can I wait and order this with a bunch of other titles in a few weeks or do I need to pounce immediately? I suspect Stothart will only have the aficionados springing the dough and therefore some time will be available. Being a reformed audiophile, I can say, yes, there was a time when we liked just two microphones. But audiophiles are crazy people so take it for what it's worth. They're obsessed with equipment and less interested in the music played on that equipment. That's why I'm no longer an audiophile. There is something to be said for limiting the number of microphones used. Today dozens are spread out covering just about every instrument. The big mixing consoles have as many as 96 separate inputs. Boards like the big AMS/Neve cost over a million dollars. And they become obsolete within a few years. In the good, old days, most studios built their own boards. Or had Western Electric or RCA fashion something for them that was customized for their needs. They hardly ever used artificial reverb. Instead they gave us the natural sound of the room. They figured most theaters were cavernous and would add their own reverb. The best orchestral recordings have been those using the simplest methods. The old Everest and especially the Mercury 'Living Presence' recordings which used 35mm three-track machines or 1/2" open reel three-track tape where just a handful of condenser mics were connected using no EQ, no artificial reverb, just the natural sound of the hall, are still remarkable when heard today. In fact, they put to shame just about any new soundtrack recording. I have several that were reissued on CD that when played sound like the orchestra is right in the room with me. To this day, nothing has matched the sound quality of the orchestral recordings done for the Cinerama travelogues. They used six Neumann U-47s on booms spaced over the orchestra feeding the signals into custom built six-track 35mm mag recorders traveling at 26 frames per second. About the only other scoring sessions that come close were the ones done at Kling Studios (formerly Chaplin) in Hollywood for Victor Young's "Around the World in 80 Days" and Morton Gould's "The Miracle of Todd-AO." For those sessions, Stage 2 on the lot was converted into a state-of-the-art scoring stage. A trade announcement made it clear that stage would be available for any company to rent. I believe the only other score to use it was Herrmann's for "Williamsburg: The Story of a Patriot" which used six-track magnetic sound for its run at the two specially equipped theaters in Colonial Williamsburg that projected the Paramount Vistavision short using horizontal projectors. After that, the stage at Kling was converted back for filming. Today that stage is cut up into several recording studios on what is now the Jim Henson lot. For a time, A&M owned the lot. What's truly incredible is all those Cinerama travelogues had their scores recorded in a converted indoor tennis court located in Oyster Bay, New York.